The annual Global Carbon Budget report found that, although fossil fuel emissions remained steady for three years ending in 2016, atmospheric concentrations of carbon dioxide are at an all-time high and emissions are on the rise again, says atmospheric sciences professor Atul Jain. Editor’s note: On Dec. 5, the Global Carbon Project published the Global Carbon Budget 2018, giving world leaders access to data on atmospheric carbon concentrations, emissions and trends. 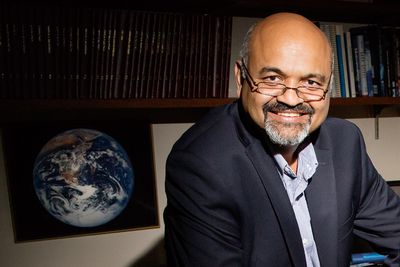 Illinois atmospheric scientist Atul Jain was among the many scientists worldwide who contributed data to the report. Jain talked about the carbon budget and this year’s findings with News Bureau physical sciences editor Lois Yoksoulian. The global carbon cycle governs the buildup of atmospheric carbon dioxide, the single most important greenhouse gas produced by human activities. Due to man’s interference with it, the carbon cycle has become the most important biogeochemical cycle of the earth-atmosphere system. This cycle relates to climate change, because carbon dioxide currently accounts for about 60 percent of the net heat-trapping effects of all greenhouse gases and has a strong potential to affect Earth’s future biosphere and climate. When we compare historical temperature data and carbon dioxide concentrations, we see that they are changing in tandem. This observed relationship is likely to continue. Therefore, understanding how the carbon cycle works is critical for predicting the evolution of atmospheric carbon dioxide and Earth’s future climate. That’s correct. Fossil CO2 emissions saw slow growth from 2014 to 2016 as a result of significant reductions in coal use in the U.S. and China. China reduced its investment in energy-intensive construction and the U.S. saw a shift from coal to gas, solar and wind power. However, not everything looks so bleak. While progress seems slow now, it is on track to deliver a very different decade – and century – ahead. For example, we are at the beginning of new exponential curves on renewable energy, electric vehicles and green finance. Serious deployment of solar or wind energy was unthinkable just 10 years ago, but the world started commissioning more gigawatts of clean energy than fossil fuels starting in 2015. Today, more than 50 percent of new electric generation capacity is renewable. In 2017, renewables accounted for the majority of all new power-generating capacity in developing countries, a remarkable turnaround from just a decade ago. Total historical renewable energy production hit 1 trillion watts of capacity three years ago. The next 1 trillion will be added in just four years. If these trends continue, renewables will produce half of the world’s electricity by 2030. In addition to all these efforts with emerging technologies to deliver reductions in emissions, strong policy support is needed. With over 100 co-signatories from political, civil and industrial sectors of society, it is clear that a shared purpose and optimism will help us meet this monumental challenge. Editor’s note: To contact Atul Jain, call 217-333-2128; email: jain1@illinois.edu.